Based on Mary Norton’s books about the Borrowers, is this1997 adaptation (and I use that term loosely), where the Clocks are a family of “Borrowers” – a kind of miniature humans that live under our floorboards and in our walls, living off things which they “borrow” from us humans. There’s father Pod (Jim Broadbent), mother Homily (Celia Imrie), daugher Arrietty (Flora Newbigin), and son Peagreen (Tom Felton, five years before the first Harry Potter film, aww). The “beings” (humans) that own the house they live in, are the Lenders: father Joe (Aden Gillett), mother Victoria (Doon Mackichan) and son Pete (Bradley Pierce). Pete spots the Borrowers, and is intrigued by having little people in the house. Also stars Mark Williams (Arthur Weasley in the Harry Potter films) as the funny exterminator Jeff, Hugh Laurie as a police officer, Ruby Wax as a town hall clerk and Raymond Pickard as Spud Spiller. Awkward family photo is awkward. Everything is bright and colourful in this adaptation, and for some reason, all Borrowers have curly, reddish hair, as if they’re some kind of Hobbits with crazy hairdos and freakishly big teeth. Anyone care to explain that one? Because as far as I recall (and let’s face it, I probably read these books last when I was about ten), Borrowers were just miniature humans, which means they weren’t half as quirky as this film makes it out. And while we’re at it, I also don’t remember Arrietty having a baby brother! Not that I don’t love Tom Felton, who is really adorable here, but there are adaptations, and then there are “we just borrowed – har-har – the main concept, sort of, and made something new with it”. When I heard the BBC were making an adaptation for Christmas 2011, I went and got a Borrowers omnibus, which I’ve yet to read, but I’m pretty sure the original books have very little in common with this technicolour farce. I remember the Clocks hitching a ride in (or living inside?) a teapot in the country, trying to get to to a town – not being chased through a dairy plant … which is another thing I’m wondering about. This is a kids’ film, no two ways about it, but wasn’t it quite perilous for one of them? Getting trapped inside a milk bottle and it filling up with milk and then getting capped off sounds not just like a contamination issue for the factory, but a severe drowning hazard for a Borrower – and a child at that! Won’t that be really upsetting for a small child to see, even if the little Borrower (of course) is all right in the end? I was sitting there thinking they’d save him, they’d save him, they’d … oh, apparently they didn’t. If the film had any sort of realism to it, there would be a full milk bottle with a drowned Borrower inside it, because a Borrower is tiny, and lots of anything pouring over you at that rate and with no escape … well, you know what happens. So that would be my criticism for parents of young – or particularly sensitive – children to look our for. The strange mix of US and UK English was confusing too. Was this supposed to be set in the US or somewhere in the UK? Or some fairyland nowhere in particular? Not to mention in what time period, because it was also rather fuzzy on that point. You might like it, you might not. I found it fairly entertaining, but trying too hard to be quirky, and I’m not really a slapstick kind of person. Bonus points for Mark Williams, he was a joy to behold, and for Hugh Laurie being more Bertie Wooster than Dr House. But as a film, and as a take on a series of books I grew up reading and remember fondly, it doesn’t really work for me. 2 out of 5 paper clips. 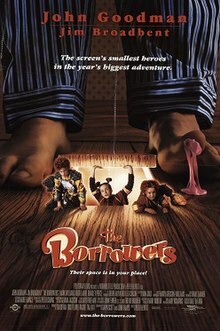 4 Responses to "The Borrowers (1997)"
I had a movie adaptation of The Borrowers on a VHS tape when I was little. It was quite faithful to the book and I liked it very much. IMDb says there’s one from 1973 and one from 1992, and there’s an animated Japanese version coming out this year. I think it was the 1973 version that I had, because I watched it when I was really wee. Try and find it, it’s not bad!